Yesterday was 7-11's birthday. In honor of that, they were giving away free slurpees...while supplies last. Apparently those supplies didn't last so long. While Connor was napping, I looked up where the closest 7-11 was and discovered there was one quite close to my house. So when he woke up, to 7-11 we went. My first clue that this wasn't going to be an easy trip should have come when the line to get in the parking lot was down the street. Seriously. For a free slurpee from 7-11. I decided to park around the corner and walk in. When I got to the front door, I was greeted with a sign that there were no longer any free slurpees. And slurpee wasn't even spelled correctly. Come on 7-11 workers! Since I was already there, I decided I would just buy a slurpee*. That should have been easy. Except for the fact that most of the other people that came had the same idea. So the line to get a slurpee was about 15-20 people long. And Connor wanted to be held. The whole time. Like a good slurpee addict mom, I waited in the line and held my toddler up over my bump hoping the line would move quickly. By the time I got to the front of the line, about half the flavors weren't working. They weren't frozen yet. Probably due to all the abuse they endured that day. But, I didn't care. I randomly selected 3 flavors to throw in my cup and went on my merry way. At the cash register, I commented to the guy about how busy it was. He looked at me totally seriously and said "not really". Oh, cause I am sure you always have a freaking long line of cars waiting to park and people rushing your slurpee machine. Anyway, we got out of the store. Connor tasted the wonder of the slurpee and didn't want to share. 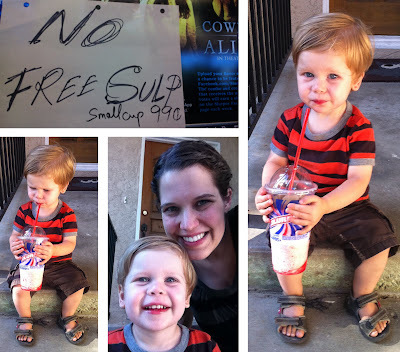 When I went to put him in his car seat, I had to take the slurpee away. He screamed. And he proceeded to scream the whole way home. I wouldn't let him have the slurpee in the car. I didn't want it all over the place. But after we got home, back to slurpee heaven he went. And, Connor even managed to share a bit with his mom. Thanks kid! * I think the whole thing was a scam because 7-11 knew people would just buy a freaking slurpee after all the trouble they went to getting to the store in the middle of the freaking summer. Scam. But hey, I still bought one, so I guess they won. Crazy! I only celebrated 7-11 once... My problem (originally) was that they only gave out free mini 4oz cups for the slurpees so it was more like free slurpee samples. BUT, our plan was to hit up as many as possible and after about 5 of 'em, I was real glad I wasn't consuming a big ol' full sizer at each place. Apparently that can cause some... problems, digestively speaking.